During the fur trade era, centered in the Rocky Mountains of the American West, trappers often took Indian girls for their wives. It was a mutually beneficial arrangement for obvious reasons, and the Indian girls could look forward to receiving many material things from their white husbands that they might not be provided with otherwise; for the man, a loving companion capable of cooking, cleaning & tanning hides, making clothes, keeping camp, etc. The wedding was a simple affair, usually involving the exchange of a number of items of value by the trapper to the parents of the girl. Items included horses, trinkets such as beads, cloth, & knives, and traditional blankets. 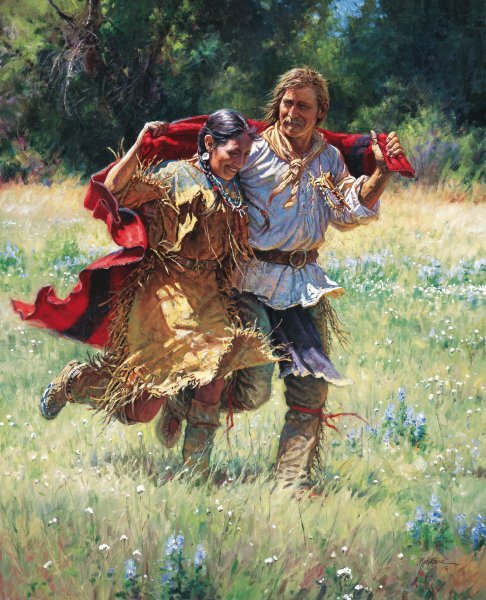 In the painting, the gifts have been accepted by the parents, the girl has been given to the trapper, and the newlyweds are beginning their life together by the traditional wrapping of a blanket (buffalo robes were also used) around them and running to their own lodge or camp. "Newlyweds" is personal commission. Orders will be accepted until June 30, 2009 when edition sizes will be set. Edition sizes for this Giclee on Canvas will not exceed 125 Signed and Numbered, 15 Artist Proofs and 25 Signed and Numbered Grande Edition.